A new 700-nanometre plastic film - about 130 times thinner than a strand of human hair - invented by Singapore-based start-up Tera-Barrier Films (TBF) might just be about to revolutionise the way food, pharmaceutical and electronic products are packaged globally. 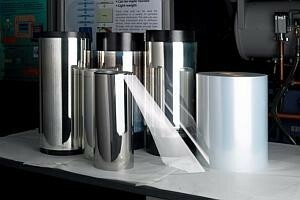 This new material - poised to replace the current aluminium packaging in the above industries - is not only as effective as aluminium in keeping air and moisture at bay and prolonging product shelf-life, it is also stretchable, highly transparent and less expensive. The Business Times understands that the plastic film can help manufacturing companies save up to 50 per cent in packaging costs. "Aluminium packaging, which constitutes the majority of food and medical packaging at present, comes at a high processing cost, is not flexible and is prone to cracks when crinkled or not handled carefully," said Senthil Ramadas, chief technology officer of TBF and inventor of the plastic film. "It is also not transparent - you cannot actually see what you are buying or determine whether goods are already damaged; and it interferes with electronics, making the integration of radio-frequency identification (RFID) devices difficult." But with TBF's new technology, companies can potentially integrate RFID chips into their packaging to enable better stock management and security scanning, and reduce shop theft of their products. The new plastic film also renders food products microwavable, and offers see-through packing and a longer shelf-life. Explaining why this technology is particularly significant to Singapore, Mr Ramadas said: "Singapore is a major biomedical, pharmaceutical and electronics hub. This home-grown, patented technology will further contribute to the cost competitiveness of such businesses and even benefit some of our local small and medium-sized enterprises involved in the packaging value-chain in these industries." TBF, which he co-founded with Mark Auch and Exploit Technologies in 2009, is a spin-off company from A*Star's Institute of Materials Research and Engineering. It owns some 56 patents on transparent gas barrier, encapsulation and gas permeation measurement technology. According to global research group Research and Markets, the global packaging market value is projected to reach US$99.6 billion by 2018.